leading to the upstairs where you will find the 2 large but cozy bedrooms. the front yard, and one on each side of the house, both having a view of the back yard and pool! On those chilly or hot days when your Sims would prefer to stay in and relax by reading a good book or just lounging, they may use the sunroom at the top of the stairs. What a great house! 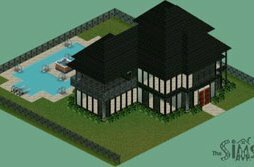 Sims home has a living room with fireplace, a kitchen off of the living room with a dining room that has a perfect view of the pool and 2 bathrooms located on the first level. Upstairs, is a very large bedroom with an ajoining bathroomand a walk out balcony-terrace that overlooks the grandeous swimming pool. Swim to the hot tub on a platform in the center of the pool. This home comes equipt with a secret passageway for the telepad. Yours Sims Family can enjoy the comfort of this beautiful, luxurious home feeling safe and secure with the entire lot surrounded by a wrought iron balustrade fence. This cool house is stilted on columns of ivy above a water garden the size of the entire house, with a pool in the center. This open and airy home has full length windows accenting the white brick exterior. Windows encircle the entire upstairs. The floors are made of glass, so you will have a wonderful panoramic view of the pool and water garden below. For the water loving Sims Family!